The final presidential debate focused disproportionately on the Middle East. Four of the six segments were on the Middle East, just two on other topics (one about the U.S. role in the world, the other about China). Egypt was mentioned 11 times, Libya 12 times, Iraq 22 times, Pakistan 25 times, Syria 28 times, Afghanistan 30 times, Israel 34 times, and Iran 47 times. In contrast, the European crisis got no mention, nor did India, Germany, Canada, Mexico, Venezuela, Brazil, or Australia. Barack Obama has a weak record in the Middle East, but one would not learn this from the debate, where Mitt Romney praised Obama's achievements ("It's wonderful that Libya seems to be making some progress"), agreed with Obama more than he disagreed, and rarely pointed out his failings. Presumably, Romney took this mild approach to establish his likeability, competence, and suitability to serve as commander-in-chief. Expressions from the third presidential candidates' debate, focused on Middle East policy. When asked about Egypt, Romney digressed to the need for a strong U.S. economy. When asked about American's role in the world, he touted the achievements of 4th graders in Massachusetts during his governorship. Perhaps his recurring emphasis on the economy will win over the elusive undecideds, but it left this viewer frustrated. The Libya topic was Romney's great surprise and his missed opportunity. Asked a softball question about the mistakes made in the aftermath of the attack on Benghazi on Sept. 11, 2012, he talked about better education, gender equality and other worthy goals – but ignored the opportunity to establish that the Obama administration is not only inept but engaged in fabrications. Most agonizingly, Romney congratulated Obama for taking out Osama bin Laden without noting that this did limited good, for Al-Qaeda still had the ability to attack and kill Americans in Benghazi. In terms of policy, Obama made statements about Iran worthy of note: "As long as I'm president of the United States Iran will not get a nuclear weapon. … A nuclear Iran is a threat to our national security, and it is a threat to Israel's national security. … We are going to take all options necessary to make sure [the Iranians] don't have a nuclear weapon." Oddly, Romney replied with a detailed program of actions (such as indicting Ahmedinejad under the Genocide Convention) but did not make parallel statements of intent. Oct. 23, 2012 update: Having been criticized by some for my response to the 2nd debate, it might be useful to explain what I am and am not doing in these analyses. Although sympathetic to Romney, I am not flacking for his campaign. I write to express my sincere opinion and assume that readers want that from me. My opinions focus on the Middle East dimension of the debate, rather than its possible impact on the presidential race. 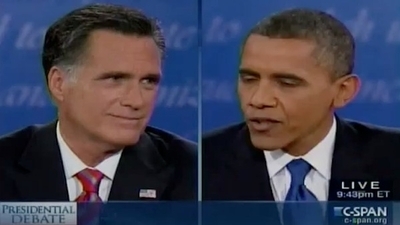 Perhaps this debate stopped Romney's momentum, perhaps it did not; that is not my topic. Nov. 7, 2012 update: Republican party loyalists claimed that Romney did a great job in this final debate. I guess they were wrong and Romney really did stumble. Actually, my instant response to Romney's not addressing the Benghazi issue was much stronger than I indicated above, and I regret not having the courage of my convictions to record it at the time. As Romney avoided the Libya topic, my face flushed and I thought to myself, "He has right here lost the election." After the debate ended, I watched as learned commentators congratulated Romney for finessing this contentious issue in the pursuit of moderate voters. I disagreed intensely but faltered, figuring that Ohio undecideds not being a subject I know, I should defer to them.